Yes, we’re back, site and Phonogram both. And here’s what Kieron wrote at the same time as its announcement at Image con. Grand Image Uberlord Eric Stephenson has just announced Phonogram’s return in 2012. 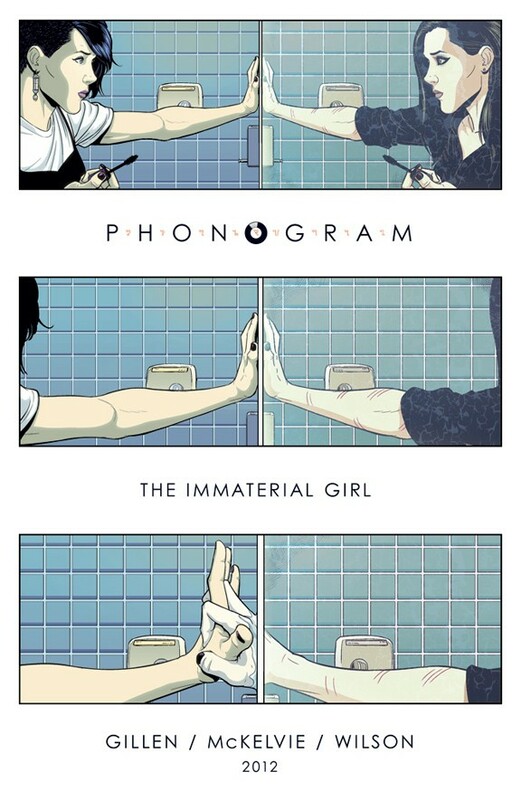 We’re still finalising the date, but I suspect PHONOGRAM: THE IMMATERIAL GIRL will drop in November. Clearly, with it being a little off, we don’t want to say too much now, but I’m sure there will be questions on your mind. We’ll try and answer the main ones. Firstly, yes, we confirm it will be awesome. Secondly, THE IMMATERIAL GIRL will be six issues. We’ve talked a little about what a hypothetical third Phonogram would be about in interviews, and almost all of that is in here. It’s primarily about the war between coven queen witch Emily Aster and the half of her personality she sold to whatever lies on the other side of the screen. It’s about identity, eighties music videos and further explorations of Phonogram’s core “Music = Magic” thesis. There is horror. There are jokes. There are emotions. There may even be a fight sequence. It also takes A-ha’s Take On Me with far too much seriousness – which, for us, is the correct amount of seriousness. Thirdly, for those who don’t know about Phonogram, don’t worry. While part of a larger sequence, all Phonograms stand alone and can be consumed in any order. For example, we normally recommend people start with our second volume, THE SINGLE CLUB. What we’re saying is “You should feel free to start here.” Of course, if you want to run out and buy all the fine Phonogram product, we’re not going to try and talk you out of it. Fourthly, we’re not talking about single-issue format yet. In fact, we may not talk about it at all and have it a surprise what you find inside each time. We hate to repeat ourselves. And finally: we said we couldn’t do any further Phonogram. We’re doing more Phonogram. What’s changed? Circumstances have changed. Sorry to play enigmatic, but it’s just financial stuff and the day when the most important thing about Phonogram are lines on a graph is the day the little Phonofairy dies. The most important reason for our return? Phonogram felt like unfinished business. While each volume stands alone, knowing we were so close to giving a little closure to Emily, Kohl and the rest was more than we could bear. So we’re doing it again.